Last week at Bunco, my friend Kristen served all of us lucky ladies Strawberry Italian Sodas. Man, they were so good and they really hit the spot for me. 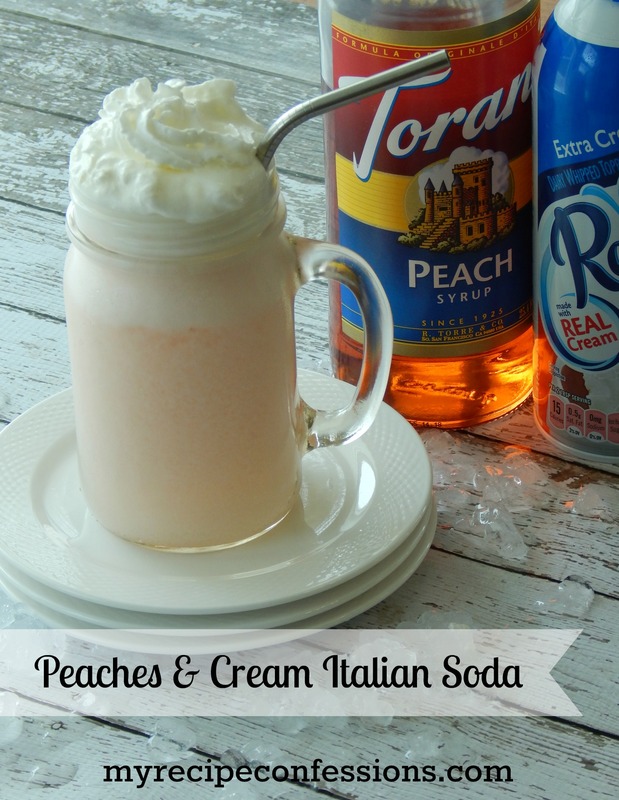 I have had a bottle of Torani Peach Syrup sitting in my pantry for a few months now and after I had Kristen’s Italian Soda, I had to break it out. My family loved the Peaches & Cream Italian Sodas. It was the perfect refreshing drink on a hot summer day! I can’t wait to try more flavors of Torani Syrup in my Italian Sodas! 1. Pour the club soda in a cup. Add the peach syrup, pineapple juice, and half & half. Gently stir the mixture. Add the pebbled ice to the cup and top with whipped cream.